Notice the scalloping – wear features shaped like spoon scoops, they are indicative of the water speed and direction of flow. The roof above is grey and hard and worn smooth – no sign of the ceiling joint that governs passage direction in many Ontario caves (e.g. 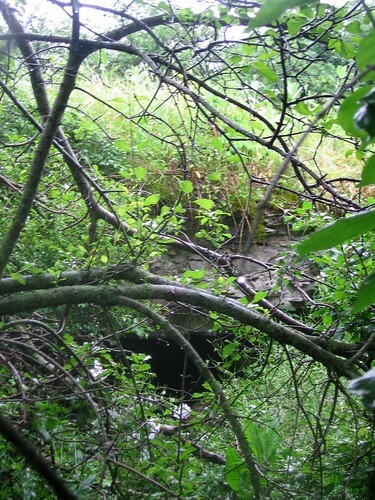 Ongleys Hole/ Dewdney’s Cave), so as for water just trickling in from the fields above, that does not seem to be an option at this time. The water certainly rises high in the tunnels, but today it is drizzling outside and no sign of raised water levels. Up ahead there appears to be either deeper water or less rubble in a “T” junction. I wonder if the left leading junction meets up with the surface depression that we saw? Does it function as an overflow conduit like in Little Stream? We are left considering the possibility of some kind of dendritic feeding system, or a single point at which the water sinks. The passage seems to be widening up ahead and so we resolve to return to “Dead Mouse” in about two weeks with the appropriate equipment and push on deeper in. 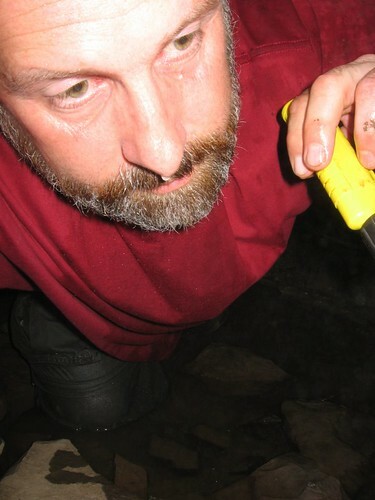 I am crawling along on sharp edged cobbles, a lot of the time with my flashlight in my mouth. For the dead mouse that we found, we decided to call this cave “Dead Mouse” – as in, “Wear kneepadswhen you are visiting “Dead Mouse”, and be prepared to get wet as I can see that there will be a belly crawl up ahead”. We realized that we were inadequately prepared to explore this new cave, we had only one flashlight and crawling on the cobbles without knee pads was painful to say the least. We resolved to poke our heads in a short distance and see what lay ahead with the intention of surmising what lay beyond that. I am left with the impression of a system somewhat similar in appearance to Nexus cave in the Eramosa Karst (Hamilton), but the tunnels are a little larger in this passage. I believe that the cave at the entrance is only a short distance beneath the rock, but with around 15 feet of dirt above the rock – that’s unusual in ontario, most Ontario caves are just beneath the cedars – little in the way of dirt above them. I do not see much in the way of mud and sediment banks in the trenchway that I am crawling along. Like Nexus, the rock is thinly bedded and from what I could see, much of it juts out into the passage. Soon the water is getting deeper. The big mystery to us is still where does the water come from, a sinking stream, percolating throught the farmer’s fields, just dripping out of the strata with the snowmelt? 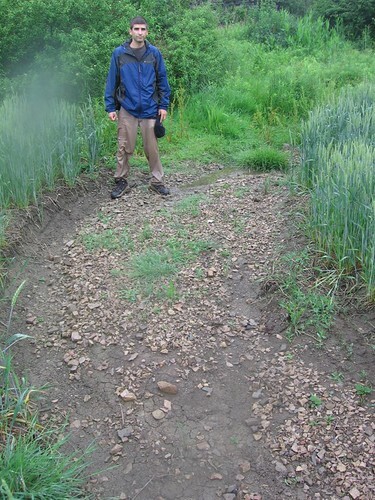 Immediate impressions at the entrance – the tunnel sloped down into water, a wide trench had been worn into the floor and though the water was not flowing at the time, it certainly flowed some times as the debris out front suggests a significant rush of water. Bigger slabs were deeper into the tunnel and with distance from the mouth, the debris got smaller. Both Jeff and I were extremely excited, I know of no other cave down along the shore of Lake Erie in Devonian age rock – though both Ongley and Martin Davis make reference to that possibility. I suspect one of them might even mark a Lake Erie cave on one of their manuscript maps (I’ll have to check it out tonight). 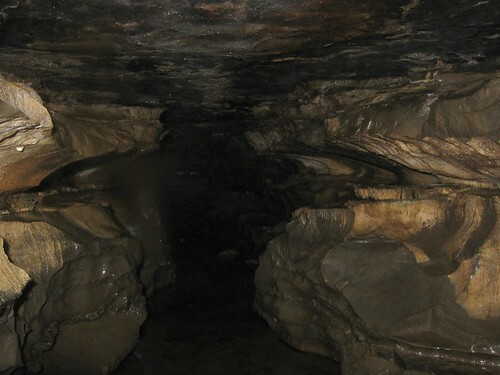 Has anyone else out there discovered caves or a cave along the northern shore of Lake Erie? Pushing our way through hawthornes and various bushes we approached a low escarpment, it broke the edge of a farmer’s field and then disappeared under a mound of rich, brown soil. Usually a cave is telegraphed to those above it by sinkholes and other features – nothing here but rolling hills of wheat and upon reflection, another waterway that joins the mudway along which we approached, it will require checking on our next visit. Who says there are no caves in Ontario? A chance encounter on a bridge over a shallow ravine led us here to this swath of pebbles and rock that cut through a wheat field. We had been looking through the area as the air photos suggested the liklihood of caves. Jeff had seen several promising stream features – streams that would disappear in piles of breakdown to be specific. While peering over the edge of the bridge a local farmer stopped and our converation led to caves. “Umm, no, not really, unless you could call that one on the …..’s property a cave, its more like a fox hole, kids went down there. I dont think it goes anywhere – maybe a few feet”. Well you can imagine where we were headed off – to see the fox hole and it turned out to be more than that. After speaking to the owners who had heard of a cave at the back of their property, but never actually saw it, we were off down a fenceline that intersected what we assumed would be where water flowed from the cave. 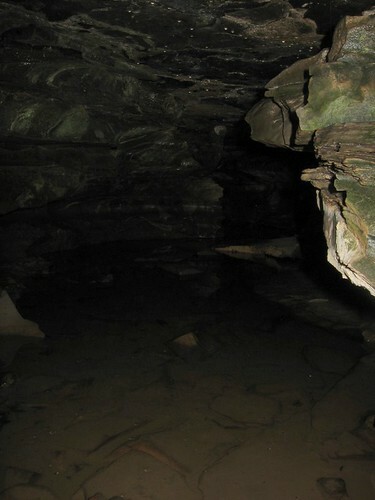 This picture was taken at the edge of a field that is plowed each year, you can imagine the nature of the water flow coming from the cave, it is brief in duration, possibly tied to downpours and with it the water drags a fair amount of debris. Needless to say Jeff is probably scouring all related air photos at this very minute to look for other caves that might be in the area. More on this cave in upcoming posts. Quartz seam in which the gold was found is pushed up against the rock face. 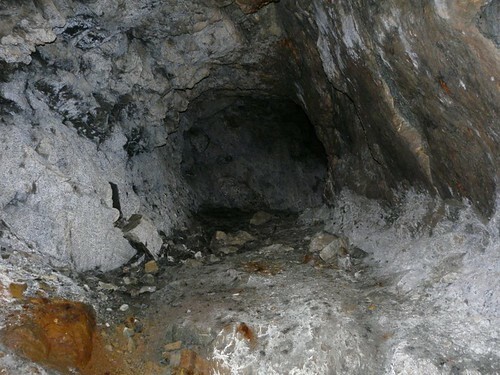 Looking in from the entrance of the mine, this tunnel leads on for a short distance. The granite headwall against which the quartz seam seems pushed appears on the right. Further back in the valley outside the mine, the surface extension of this granite face hangs out over the valley and then bends around to appear as the face of a smooth polished cliff that can be seen from a nearby meadow. The air is dead in this tunnel – thus it would be reasonable to assume that it ends quite shortly, however the downward leading hole as seen in a previous post blows cold air and possibly contributes to the growth of a large, jagged lump of ice. I am reminded of an iceberg as the ice is all scalloped and smooth with nothing like the drip deposited features seen in the typical cave ice stalactites and stalagmites seen in Southern Ontario.